Whether you’re working for a small business or publisher, what you’re often looking for is a sustainable source in growing their business or traffic. Blogging is well-known and with content being channel agnostic, it’s important to change your approach based on the changing trends and platforms that serve your audiences. So with this, it’s worth noting the fact that social sharing has declined by 50% in the past 3 years and that Google’s dominance in driving referral traffic to the sites continues to grow. Regardless of these changes, what can we do to demonstrate a brand’s strong sense of purpose and recognition in their topic expertise? A content pillar is simply a representation of an overarching topic of an overall site structure. There are two types – 1) Topic pillar – it could be a single site category made up of articles and 2) Resource pillar – a comprehensive resource page that fleshes out different aspects of a topic. SEO benefits – The more long tail sub topics you can capture as part of your content pillar, the more content you can potentially rank and drive ongoing evergreen traffic to your site and keep you focused on what your audience is looking for. Repurposing opportunities – Since content is channel agnostic, you can reuse the content on other channels and formats broadening/amplifying your audience reach. For example, having several blog posts converted into an email series. Better engagement – The value, especially from a resource pillar a user receives means that people will trust the content more and it can lead to likes, shares, and users linking to the content resource. Conversion opportunities – Prominent CTA’s within the content can also lead to better leads and desired outcomes. A typical way of developing a content pillar, as mentioned, is to develop a cluster of content that can be tied to one overarching theme. The first type is a Topic Pillar. 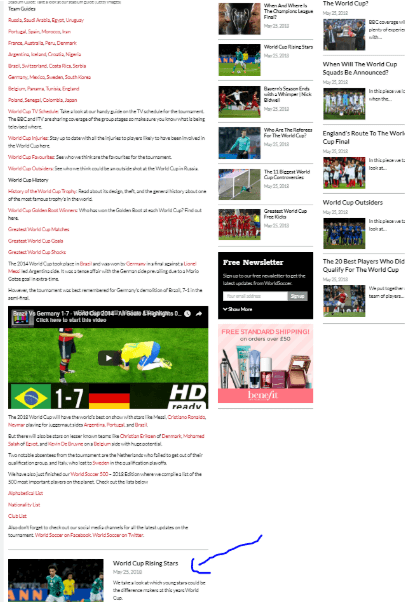 The first example is from worldsoccer.com which links to all the searches in the lead up to the World Cup. 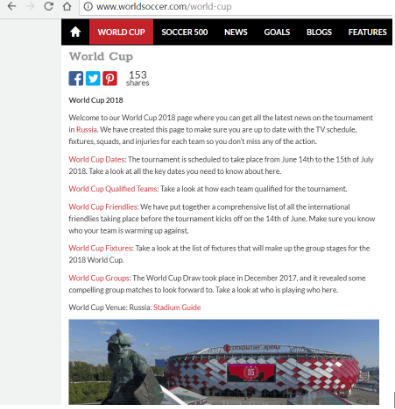 The clusters (subtopics) relating to the history of the World Cup is included and finally the latest news and topical post are there as the latest blogroll at the bottom. 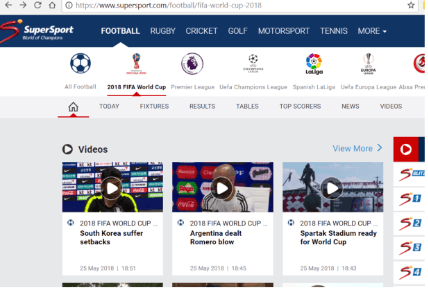 For Supersport, they’ve taken a more streamlined approach by focusing on just the match playing aspects of the World Cup. You can see that the FIFA World Cup 2018 is the core topic acting as a central hub to the topic clusters pertaining to it. The other type is a Resource Pillar. 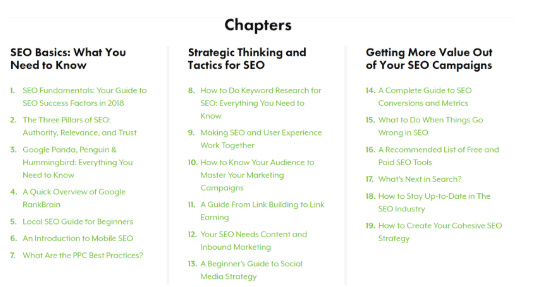 Search Engine Journal offers a complete SEO guide which is broken up into fourteen chapters ranging from tactics, metrics, and different facets of SEO. 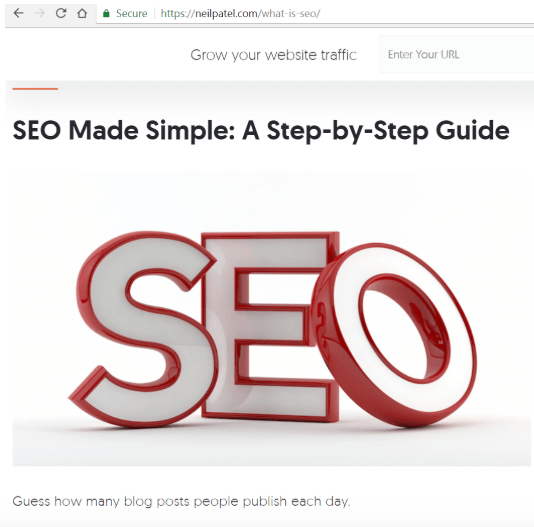 Or you have an overall piece of content, like the one from Neil Patel, which is overcompassing of the topic and is broken up by different headings & sections within the article itself. Before you throw yourself in the deep end, it’s important to have a baseline knowledge of developing a content marketing strategy. Here’s a resource for you to get started and to start putting together your plan. While going through the steps, assume you are doing things from scratch/from the start and that you have the baseline research and plan in place to then proceed with the execution. Conduct social media and long tail research using tools such as BuzzSumo and keywordtool.io. 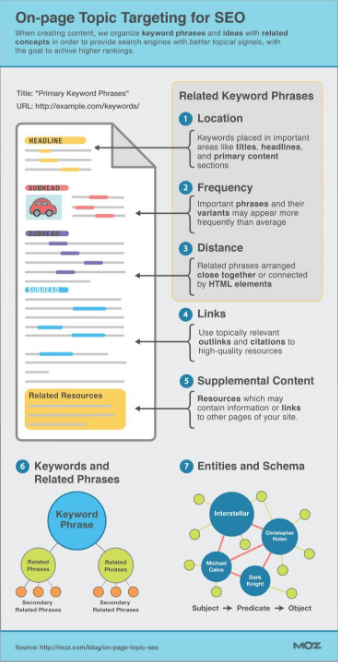 Validate through your keyword research to understand the full breadth of topics that are available for you to target. John has outlined the main ones in a previous post. Determine whether you’d like to cover the topic extensively. Content marketing for mindshare to leads require different content formats and effort. So, it’s important to differentiate the two and ensure you have consistent resources to tailor to this. Prioritize based on seasonality and keyword difficulty. Review your current content inventory and existing site performance. If you have an existing content piece which you can simply upgrade it and prevent keyword cannibalization or you can add internal links to better emphasise its performance. Determine where it will sit within your site’s architecture. Are you focusing on one blog piece that can warrant you to have this listed within the blog or do you need to expand into new categories and site sections that can help truly show yours/your clients’ expertise for that content pillar? Decide on the topic pillars that you will be creating, based on the desired achieved objective. Mapping out 5-10 topic areas corresponding with the topic pillar. If we take ‘World Cup 2018’, for example, some topic areas can include ‘Fixtures & Matches’, ‘Results’, ‘Stats’, ‘Standings’, and ‘News’. Flesh out clusters associated to the topic area. Looking at ‘Fixtures & Matches’ as an example, this can be ‘France vs. Australia World Cup Match’. Conduct SERP competitor research to see how existing competitors perform and see whether there’s an opportunity to create 10x content on this. Once live, measure and refine your content as need be. Your content pillar is like a garden and it constantly needs nourishment to maintain its health and longevity. That’s where content pruning comes into the process. Your content pages still might not be ranking on the first page. Or maybe they are, but you do not see the expected traffic and landing page conversions from an organic search perspective. This situation could be due to an engagement (relevancy), click through, or ranking issue. So, what’s the best method for continually monitoring your performance and testing it in a methodical fashion? David Krevitt has come through with the goods. Using his “Search Efficiency by Page” tool, (linked to Google Analytics and Google Search Console), you can focus on your SERP snippet optimization or on-page optimization for better content performance. Check out the video below to see how to set up the tool step by step. Whatever cycle you choose, where it be 30, 60 or 90 days, being consistent with your testing can help you develop a tailored optimization method. Being consistent will also increase your chances of success with your future content marketing and SEO efforts. Creating larger content pillars isn’t always better and it’s important to emphasize again that this is a continuous approach that will help you or your clients with their content marketing strategy once you can get the wheel flying. By focusing on your capabilities and always planning for efficiency, you can better resonate with your audiences and get more return from your efforts. This is an amazing piece. I’ve learned about pillar content piece from Brian Dean’s skyscraper technique. It does work great, but not always. Ahrefs have published a great article showing that the results of a pillar post shouldn’t be expected to be extraordinary. Granted, they usually do better than normal articles, but you can’t expect they will rank you on the top. Your post, however, does a great job outlining the right process of working on a pillar post. This gives more credibility and authority to the website, rather than simply writing content without having any purpose.